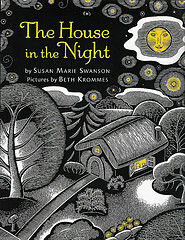 The House in the Night is a fantastic modern nursery rhyme. It’s a great bedtime or nap time story with a cumulative pattern poem and unbelievably charming illustrations by Beth Krommes. The black and white scratch images with golden yellow highlights are just excellent counterpoints to Swanson’s poem. This is the kind of high impact little volume that kids will reach for over and over at bedtime, like the classic Goodnight Moon. The tone and rhythm is perfect for kids about to go to sleep, and the illustrations are just dreamy. It’s delightful. Maybe some Caldecott consideration for 2009?